We asked Cristina Camacho a few questions about her project for the West 10th Window, the viewer's experience of her work, and what it means to her to be a contemporary painter. Read on for more! Art-in-Buildings: Can you tell us a bit about your practice in general and what interested you about the West 10th Window? 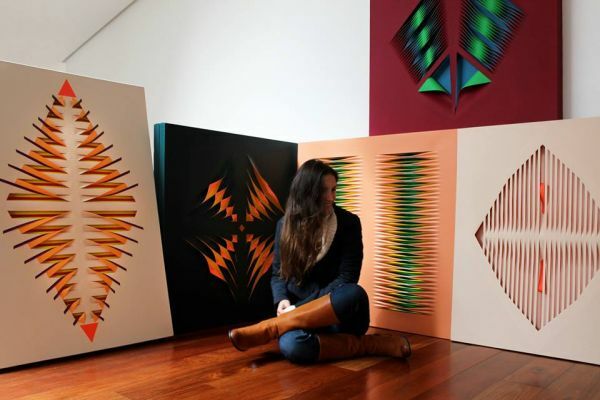 Cristina Camacho: In my paintings I like to reimagine the materiality of the canvas. To stop working with the material as a surface where the paint goes, and start working with it as the medium to create images. I paint, cut, and juxtapose layers of canvas. I think of my process as a dissection of something. In my most recent body of work, I created anthropomorphic and zoomorphic entities, where I dissected the skin to reveal the interior of something. The West 10th Window was an interesting challenge for me. For the first time I needed to create a site-specific painting. I think of the space as a window display in a natural history museum that contains a dissected animal. The piece itself is a rare species found in a hidden tropical forest, and after being dissected it is exhibited for people to see. Art-in-Buildings: Your work, and especially Dissections at the West 10th Window, straddles the divide between painting and sculpture. Do you identify strictly as a painter, and if so, what does it mean to you to be a painter in our contemporary moment? Cristina Camacho: Yes, I do identify strictly as a painter. My work often reacts to gravity, light, and space as a sculpture, but at the same time they always stay in the realm of painting. What does it mean to be a painter in our contemporary moment?? I'm still trying to understand that myself. Art-in-Buildings: Working with layers of stretched canvas as you do, what does the frame mean to you? Is cutting the canvas and creating depth through layers a way of breaking out of the frame, and out of pictorial space? Cristina Camacho: I use the frame to remind myself that I am making paintings. Most of the time, the cut remains inside the frame. I am not trying to break the pictorial space, I am doing what painters always do, creating volume and space. The difference is that I am actually making it, I am creating images without tricking the eye with the use of perspectives or painted shadows. I am literally creating the volumes and the shadows inside the pictorial space. Art-in-Buildings: Where do you locate the gestalt of the work? Is it located strictly within the specific object itself, as in Cubism, or do you find it in the dynamic space between the work and the viewer, as Robert Morris theorized in relation to Minimalism? Does the viewing experience change for you with the work behind glass at the West 10th Window? Cristina Camacho: I believe my work presents a phenomenological approach by defining the physical and temporal relationship of the viewer to the painting. In order to fully appreciate them, the viewer needs to walk around them, get close and move back. The work is mostly about the experience of looking at them. In "Notes on Sculpture," Morris talks about the unitary gestalt forms and how strong gestalt sensations are achieved with simple forms such as pyramids, cubes and regular polyhedrons, arguing that, "simplicity of shape does not necessarily equate with simplicity of experience." Although I agree with Morris, my work is not simple in shape and it is precisely in this point where the work differs from the minimalists. I believe in non-simple shapes and in paintings that contain narratives and imagery. The viewing experience at the West 10th Window is definitely different than the rest of my work. First, it is a freestanding painting, giving the viewer the chance to appreciate it from two different sides. The fact that you can see how it is constructed and see through the layers enters into a whole different viewing experience that when you just have a "flat" painting hung on the wall. Art-in-Buildings: What's next for you? Cristina Camacho: Keep making work and keep being surprised with each new piece.